I meant to draw just one card, but two popped out of the deck at me: a bonanza! 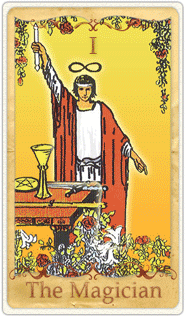 To me The Magician is a card about the power of thoughts and intentions to create reality. 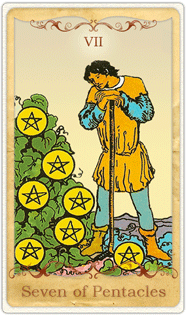 But in case we were fooled into thinking that just daydreaming about our goals would get them accomplished, along comes the 7 of Pentacles to tell us that we will be successful, but we’re going to have to invest some effort and work to make our dreams come true. If we bring both factors together: strong, clear intent plus long hours and days of hard work, we will accomplish what we set out to do. If your goal — your clear intention — is to accomplish a multitude of New Year’s resolutions, though, beware — this card combination looks to me like singleminded focus and concentration on ONE goal, the one thing that we most long to throw our heart, mind, body and spirit into. To make that one thing happen, we have to give it all we’ve got, but we can do it. Be patient with the process, because there’s a harvest coming at the end of all that hard work. This is weird – the Magician card appears for you just as I am uploading a light-hearted post about magic. What do you think this means?? Thanks. You are very good at interpreting the cards. I thought it was a bit weird that our posts on the same day were so connected and I will check back from time to time to see if there are any further such connections. Keep it up because there is something meaningful in what you are doing. I hope you will stay in touch!